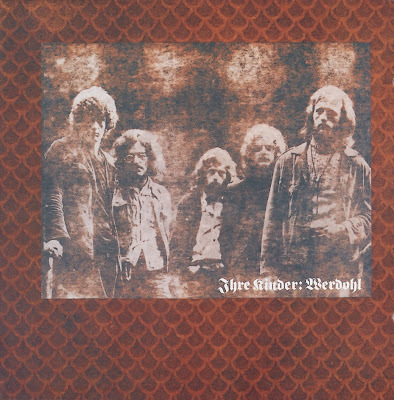 Nuremberg's most valuable contribution to the polit rock scene was the group Ihre Kinder. In the mid-sixties the pop band Jonah & The Whales was assembled, consisting of Jonas Porst (drums), Sonny Hennig (vocals), Thommy Roder (bass), Ernst Schultz (guitar) and Georgie Meyer (violin). In 1966 they recorded a cover version of "It Ain't Me Babe" for a single on Vogue (DVS 14511). This proved to be an ill-fated one-off attempt, and the group disbanded. However, in 1968 Jonas Porst and Sonny Hennig decided to form a new group. Ihre Kinder was to be a politically aware band using German lyrics. Porst's dad was a quite rich man, able to support the forthcoming activities. Porst himself soon gave up the drumming and became Ihre Kinder's producer and manager. Several demo tapes were recorded but no record companies were interested. In July-August 1969 an album was recorded in the Clerks Studio at the band's own risk; and was eventually released by Phillips. Mack had now been replaced with Walti Schneider. A female vocalist, Judith Brigger, also took part in this project. The album admittedly sounds quite dated today, featuring 12 short and easy-going folk-pop songs. Still it must be honoured as it is one of the first records (of Deutschrock!) with German lyrics. Leere Hande (1970) was a great improvement, their first true folk-rock album. The arrangements here were more varied with more use of organ, flute and electric guitars. The band had also absorbed some progressive touches from groups like Traffic and Jethro Tull. The 11 songs themselves were more memorable than those on the previous album. Some of them were written by Ernst Schultz, now added as Ihre Kinder's sixth member, the rest came from Sonny Hennig. Leere Hande was recorded during January and February 1970 in Union Studio, Munich, with Thomas Klemt engineering. It was the first release on the Kuckuck label, generously enclosing a lyrics insert and a large poster. 2375 004 went even a step further, as it was released in a denim jeans cover, even featuring washing instructions! It was recorded at the same venue as its predecessor in August 1970. Tommi Roeder had now replaced Walti Schneider. This album, entitled after its own catalogue number, was a further development towards varied progressive folk-rock and some would say that it is their best one musically. Some of the compositions of Ernst Schultz were even slightly experimental ("Toter Soldat"). In 1971 Ihre Kinder released their first single: "Die Graue Stadt" coupled with "Komm Zu Dir". After this, Sonny Hennig quit the group to realize his solo ambitions. Ernst Schultz broke with the management and took over the leadership of Ihre Kinder. Hennig contributed as guest on Werdohl, named after a small German town in Sauerland. The group now produced themselves, in Bavaria Studio (July-Sept. 1971). The technical quality had improved, but musically the band had passed their creative zenith. In Autumn 1971 Schultz set off to record his first solo album, resulting in the end for Ihre Kinder. In January 1972 Sonny Hennig put the band into new life. (F) line-up recorded the rather superfluous Anfang Ohne Ende. Another incarnation gave concerts in 1974. Hennig and Grun then founded a horrible soul pop-rock band named Powerful Tramps before regaining some musical sense for Meistersinger & Ihre Kinder, a quintet that recorded two albums in the late seventies. Guitarist Muck Groh founded Aera after his years with Ihre Kinder and recorded his solo album Muckefuck in 1979.